Our overnights are getting better, but we're still dealing with some early morning coughing that is heralding the start of my day WELL before 6 am, so I'm a bit tired. And I have the evening reference shift tonight, so I'm stuck here until 8 pm. I couldn't come in later today to compensate, due to the nefarious parking situation that I will not go into further lest I start having to strike out profanity. So it's going to be a long day. I will almost certainly be very tired tomorrow at this very same time as well. But we'll get there. I was thinking this morning as I drove in, using my winter-themed Our Lady of Lourdes/St. Bernadette rosary to pray, that I love having a novena going. It really does help to settle my mind about many things. And novenas are especially meaningful to me when I pray them leading up to the actual feast day. I mean, there's nothing saying we can't pray an Our Lady of Lourdes novena in the middle of July if we really wanted to. And sometimes, if I have a petition related to a specific saint's patronage, I do just that. But when I'm in tune with the liturgical calendar everything jives even more in my soul, know what I mean? I just love it. 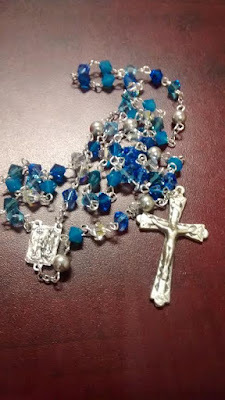 And yes, I am a total Rosary Nerd and I own rosaries that are themed around seasons as well as different saints. I keep 3-4 tucked into a holding spot on the driver's side door of my car that I rotate out every seasonal quarter. That way I can pick an appropriate one each morning as I drive. Right now I have St. Francis de Sales, the Our Lady of Lourdes that you see pictured above, and the Holy Family. Come March, I'll switch to spring rosaries like the one with a Divine Mercy centerpiece, and St. Dymphna. Maybe I'll add Pope Francis in as a spring rosary too, since he was elected to the papacy in the spring. ;-) LOVE IT. I'm not hugely into novenas, but I have warm feeling regarding them because praying novenas together was something Sr. Mary Magdalene and I often did before she entered Carmel. Maybe in future we'll get to revive that together! I do want to thank you Tiffany, I do love novenas too, and because of you I am doing the Our Lady of Lourdes Novena. I have a friend having eye surgery on that Feast Day so she should not worry at all, all will be well. Clare Ann, I am SO glad to hear this! Indeed, all will be well. Right on the feast?! Perfect!